Very well, I will honor you here. I am Suzuka. As you can tell, I am just a mere school girl. If you get cocky, I'll cut you into 3 pieces. Tenma Tachiehoushi! You have angered this Suzuka, you will repent in Naraka! Hmph, you lack fighting spirit. I will look for someone more worthy to fight. I have lost. I have done all I could do. I have no regrets. Honorless Great Summer Festival Struggle (7/5/18 ~ ? ): Tokyo Afterschool Summoners. You must have some nerve to step into our territory. A Transient originating from the Land of Wa. She is a member of the Kabukicho Outlaws, a Guild for those lost and wandering with no other place to go. She was taken into the custody of the aging leader of the Kabukicho guild, which had previously almost been wiped out by Transient mobsters from a neighboring area. For this reason, she often thinks about what she can do for Kabukicho, and cannot abide any outsider who causes trouble in her territory. 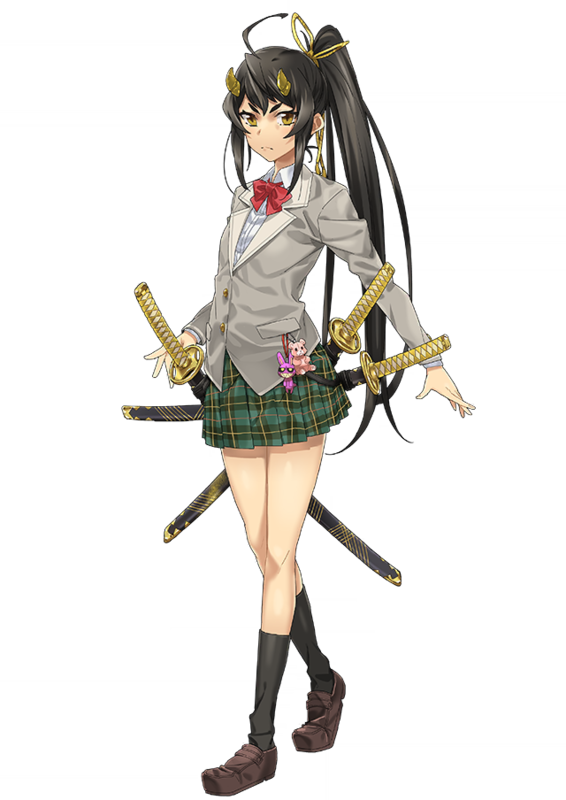 Her Sacred Artifacts are a set of three swords, which carry the power to kill even the undead when used together. She has an understanding and fondness for those who are easily misunderstood due to their appearances. A Transient hailing from Wa no Kuni. She belongs to the Kabukicho Outlaws, the guild where ruffians and directionless drifters gather. 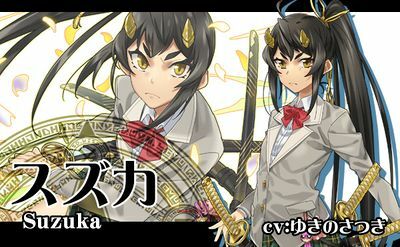 Suzuka looks after the elder yakuza boss associated with the guild, which has recently been invaded by a Transient mafia from elsewhere to the point of near collapse. Because of those events there are many times she considers Kabukicho first with unceasing trouble occuring from those who come into town without permission. The three swords she holds are her Sacred Artifact, and if she uses all of them she may be able to kill immortal opponents. She holds a feeling of mixed familiarity and good will toward people who tend to be misunderstood by their appearance or have image-character impression gaps. She uses her Sacred Artifacts, a set of three swords, for the sake of the friends she calls her family. In order to protect them, she is willing to be unfeeling and cruel. In her home world, her people were seen as bandits and unfairly subjugated by those in power. She still carries those old wounds on her heart. For that reason, she keeps her true feelings locked away, and has a tendency to say the polar opposite of what she means. Her fundamental nature is that of a caretaker, so she is relied upon by the members of the Outlaws. However, due to her past experiences, she has a strong hatred for police, people in power, and anyone who encroaches on her territory, and so she can cause quite an uproar from time to time. Despite her stubborn appearance, she has many soft spots, but she does despise those who are too similar to herself. She loves sweet foods. 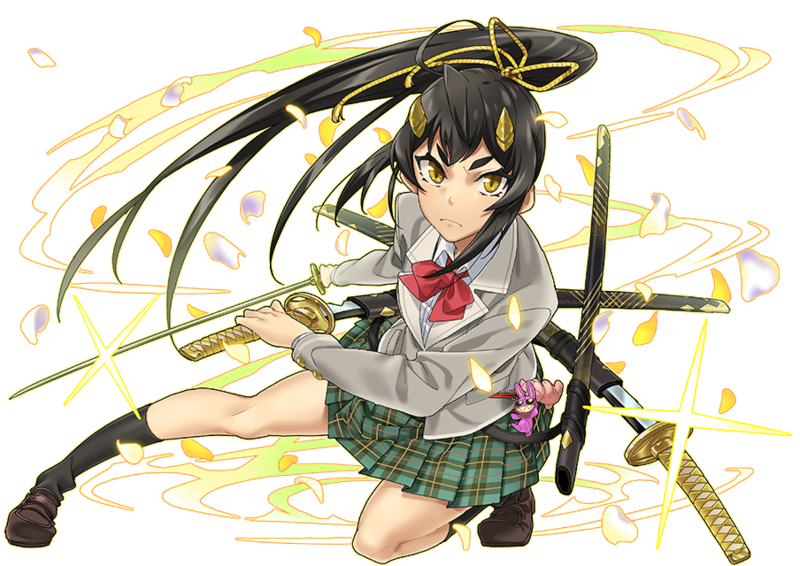 Suzuka wields the three sword Sacred Artifact she possesses to protect the friends that she can call her family, and she doesn't mind being heartless in doing so. One time in her home world, the authorities unilaterally treated her friends as thieves and subjugated them, and she carries emotional scars from this. As a result she keeps her true feelings in her chest and tends to say the complete opposite of what she's thinking about. Fundamentally her personality means she's good at taking care of others, and much of the Outlaws rely upon her. Due to her past however, she really hates authorities, the police, and those who bluntly trespass into her domain. She also often causes unnecessary disturbances. Suzuka looks stubborn but she easily falls in love, and when dealing with people of the same race she has something similar to disgust towards someone of the same family. She likes sweets. Aha! Is this our chance? i got like 5 or 6 versions of her IN A ROW and now i just got her 4* and im having PTSD of her coming 5 times and eating my rocks. 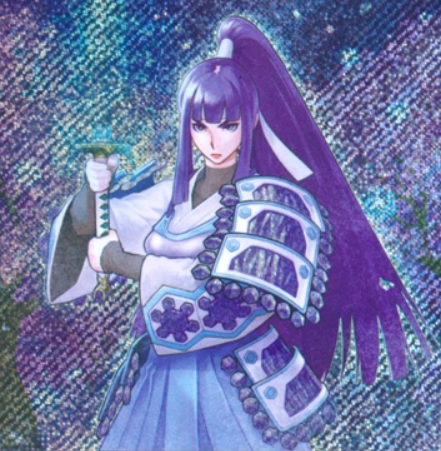 She's really cool I'd love to draw her out of the gachi. This page was last edited on 28 January 2019, at 09:39.